Over the past 10 days, two National Film School students at IADT Dun Laoghaire have competed at the prestigious Thailand International Film Destination Festival. 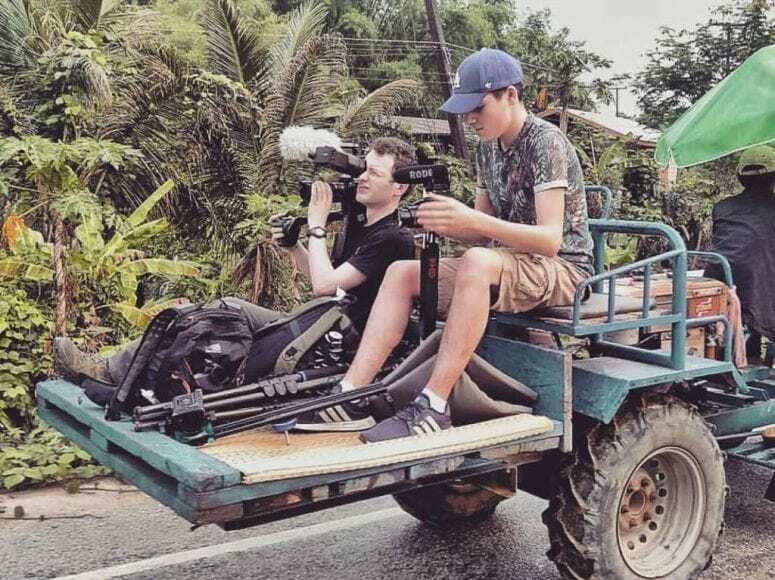 Max Barry from Stillorgan and Tiernan O’Rourke from Limerick, both third-years at the college, spent the past 10 days filming, producing and editing a documentary at the village of Khiri Wong Kot. This is the first time that an Irish group have competed at the festival. 76 different countries applied but only 22 were chosen to travel to Thailand and take part at the final stage. This year’s theme is Living Eco, Living Thai – encouraging the filmmakers to create a documentary that highlights a part of Thai life that is economically friendly while also rooted in traditional Thai culture. Barry and O’Rourke applied for the competition little over two months ago and found out they were accepted only two weeks before they had to travel. “It was all a bit mad,” says Barry’s mother Adriana Di Mascio. O’Rourke specialises in camera work while Barry directed and produced the project, Di Mascio says. According to the pair’s application video which can be found on YouTube, Barry found out about the isolated village after doing a bit of research online. “In the village of Khiri Wong Kot, they adhere to traditional Thai values while continuing to sustain their local environment,” he says. “They give tractor tours of their area to promote tourism and we believe by focusing on the tractor drivers we can delve into a deeper story,” he adds. The duo arrived in Thailand on Tuesday, March 26 before taking the long 14 hour drive north east to the village of Khiri Wong Kot. They then had three days to film and two days to edit the documentary before submitting their finished product to the judging panel on Sunday, March 31. A grand prize of 300,000 Thai Baht (approximately €8,500) was up for grabs for the overall winner with other prizes being awarded for best social media presence and best promotion of Thailand. The pair finished second, winning 80,000 Thai Baht (about €2,250) before arriving home in Dublin on Thursday morning. “I can’t express how grateful I am to get the opportunity to film in such an interesting and diverse country,” says Barry. Both Barry and O’Rourke have plans to stay in the world of film with O’Rourke currently working on RTE’s Nationwide with Barry having plans to film in Italy and the United States over the coming months.